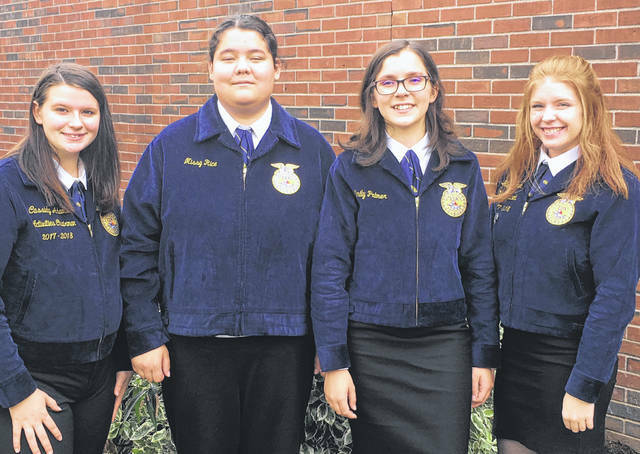 Submitted photo Greene County Career Center’s Veterinary Science team recently placed fourth at the Big E FFA Career Development Event in Springfield, Mass. Current seniors Emily Palmer and Missy Rice were joined by 2018 graduates Cassidy Adams and Hailey Bowman and put their experiences to work against teams from across the nation. Dr. Kelly Rickabaugh serves as the Veterinary Science teacher at the career center’s Agricultural Research Center. Greene County Career Center’s Veterinary Science team recently placed fourth at the Big E FFA Career Development Event in Springfield, Mass. Current seniors Emily Palmer and Missy Rice were joined by 2018 graduates Cassidy Adams and Hailey Bowman and put their experiences to work against teams from across the nation. Dr. Kelly Rickabaugh serves as the Veterinary Science teacher at the career center’s Agricultural Research Center. https://www.beavercreeknewscurrent.com/wp-content/uploads/sites/49/2018/09/web1_BigE.jpgSubmitted photo Greene County Career Center’s Veterinary Science team recently placed fourth at the Big E FFA Career Development Event in Springfield, Mass. Current seniors Emily Palmer and Missy Rice were joined by 2018 graduates Cassidy Adams and Hailey Bowman and put their experiences to work against teams from across the nation. Dr. Kelly Rickabaugh serves as the Veterinary Science teacher at the career center’s Agricultural Research Center.